I normally sleep well after a night with no sleep and last night was no excpetion. After struggling to get the babies to sleep they kindly slept uninterrupted from 8:00 PM to 4:00 AM. I actually got to sleep by 10:00 PM and mostly slept until 4:00 AM. At 5:30 AM Martin began to let out a quiet moan and act completely out of character. His hand and feet were freezing. Sure it was only 9 degrees outside but that logical explanation wasn't enough to get my paranoid brain working. I foolishly Googled his symptoms which lead me to the conclusion that he had bacterial meningitis. That was the end of my sleep for the night. I showed up at the doctor's office when they opened but they could not take us so seeing that Martin was in much better spirits I took him to day care then brought him in at the end of the day where he was seen by the doctor who concluded that he was just teething and/or fighting off a low grade virus. 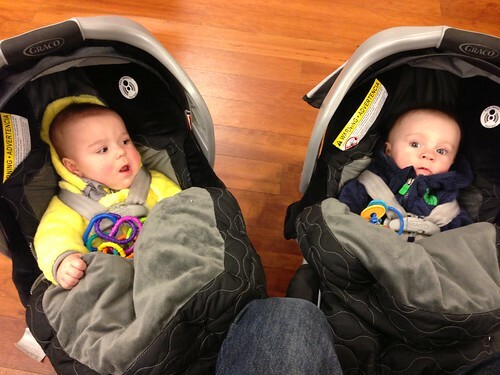 While we waited for the doctor I entertained the boys with my amazingly realistic fart noises. It was a pretty big hit but they were a pretty easy audience. I killed. The doctor mentioned keeping the babies in the bathroom while we run a hot shower. This seemed logistically difficult so I decided to run a hot shower and feed them in the bathroom. This was a little strange but it did seem to help their congestion a bit. Afterwards they lost interest in their bottles and started playing with each other and making each other laugh. Apparently they don't need my comedy any more. After getting the to bed Martin cried for a while. I tried giving him Tylenol, soothing his gums, offering him a frozen towel to chew on. Nothing worked. Then I decided that he must be hungry. I made him a bottle and he chugged it down. Apparently I forgot my own wisdom. It's always that they're hungry. It's always that they're hungry! 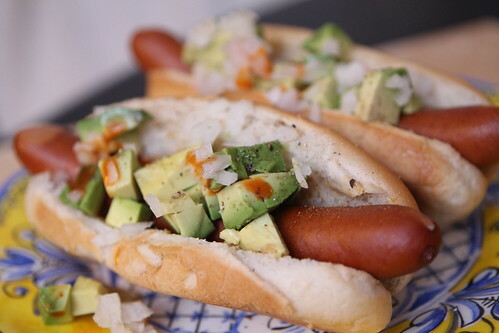 For dinner I thawed out some frozen hot dogs and made these dogs with avocado, onion, hot sauce, celery salt, and mustard. 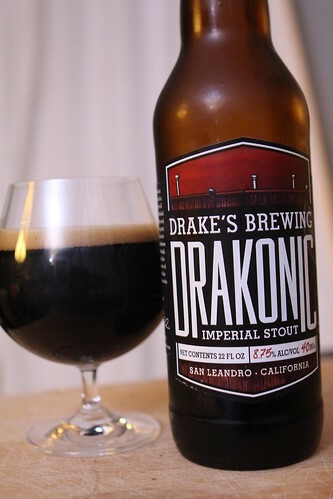 For beverage I cracked open this Drakonic Imperial Stout from Drake's Brewing in San Leandro, California. This was purchased for me by a friend at work who returned back from California. This is not available in New York so it was a real treat to try. Jen flies out soon to return home. It has been an interesting challenge to be a single parent but I am greatly looking forward to her return. Having an adult ally around in this fight will be greatly appreciated. An extra set of hands to wrangle wombats will be a welcome delight. Oh, yeah, and I miss her conversation too.